Super Fun Mixology Competition Ahead Go! Watch! Drink! Beginning May 6, 2015, bartenders from some of Los Angeles’ most notable bars, restaurants, and lounges will ready their shakers, stirrers, and jiggers for the third annual May Mix-Off, taking place at The Mixing Room at JW Marriott Los Angeles L.A. LIVE every Wednesday throughout May from 7-9 p.m. Free to the public and featuring handcrafted cocktails, guests are invited to sip in suspense while cheering on their favorite mixologists as they battle head-to-head for the winning title. The returning competition will include three rounds of on-the-spot cocktail creation, with an emphasis on recipes that showcase innovation and imagination by pairing mystery ingredients, mixers, and garnishes. The kick-off event, taking place May 6 from 7-9 p.m., invites bartending participants and the public alike to mingle over signature cocktails and small bites from The Mixing Room’s new menu. May 13 begins the weekly competition where every Wednesday evening, participants create three specialty cocktails: two using the round’s featured spirits and one using an unidentified spirit for a splash of spontaneity. Each expertly crafted creation will be judged on taste, presentation, performance, and the intensity level of the crowd’s cheers. 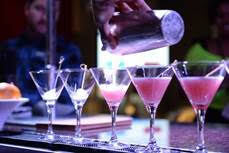 Guests will also have the opportunity to sample the competing cocktails. Winners from each week will advance to the final round on Wednesday, May 27, battling it out for bragging rights and the grand prize trip to Tales of the Cocktail in New Orleans. Notable past participants include Chris Amirault of Harlowe, Eva Pelczer of Honeycut, and Kristina Howald of Bestia. Libations ($14) featuring the showcased William Grant & Sons portfolio of spirits will be available for purchase throughout May at The Mixing Room, located on the lobby level of the JW Marriott Los Angles at L.A. LIVE. For more information, visit www.lalivemarriott.com or call 213-765-8600. Located in the heart of downtown Los Angeles, the JW Marriott serves as the focal point of the L.A. LIVE district, offering travelers a front seat to world-class sports and entertainment. The hotel features 878 stylish guest rooms, a full service spa and fitness center, outdoor heated pool, diverse dining options including Ford’s Filling Station from chef Ben Ford, and 100,000 square feet of versatile meeting space. The JW Marriott Los Angeles shares the distinctive 54-story tower with sister hotel The Ritz-Carlton, Los Angeles and The Ritz-Carlton Residences at L.A. LIVE. Steps away from STAPLES Center, Nokia Theater L.A. LIVE, The GRAMMY Museum and an array of restaurants, venues and nightspots, the JW Marriott Los Angeles is at the center of one of the most exciting parts of the city. William Grant & Sons, Ltd. is an independent family-owned distiller headquartered in the United Kingdom and founded by William Grant in 1887. Today, the luxury spirits company is run by the fifth generation of his family and distills some of the world’s leading brands of Scotch whisky, including the world’s most awarded single malt Glenfiddich®, The Balvenie® range of handcrafted single malts and the world’s third largest blended Scotch Grant’s® along with iconic premium spirits brands Hendrick’s® gin, Sailor Jerry® rum, Tullamore D.E.W. Irish whiskey and Milagro® tequila. William Grant & Sons has been honored as “Distiller of the Year” by the prestigious International Wine & Spirit Competition and International Spirits Challenge nine times over the past 14 years, and most recently by Whisky Advocate in 2013. Founded in 1964, William Grant & Sons USA is a wholly-owned subsidiary of William Grant & Sons, Ltd. and features one of the fastest growing spirits portfolios in the country, with emerging brands including Reyka Icelandic vodka, Hudson American whiskies, Monkey Shoulder blended Scotch whiskey, Solerno blood orange liqueur, Montelobos mezcal, Ancho Reyes chile liqueur, Lillet fortified wines, Art In The Age organic liqueurs. For more information on the company and its brands, please visit www.grantusa.com.